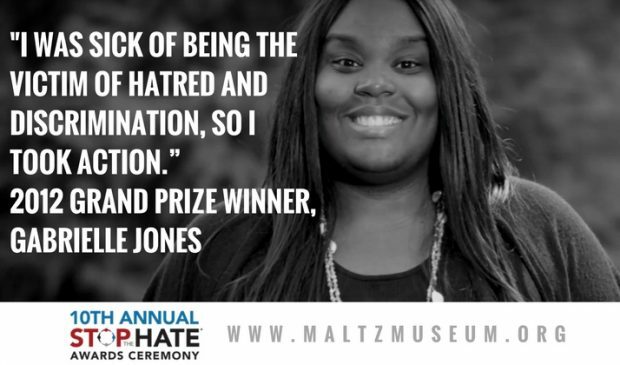 In 2012, Gabrielle Jones was the fourth Stop the Hate® grand prize winner. Read her essay below and register for the awards ceremony HERE. Growing up, I was always bigger than my peers. My memories from middle school are filled with pain. Riding the school bus did not make the situation any better. Every day when I would get on the bus, I felt like an outsider entering into territory that was not my own. Words like fatty patty and elephant filled the air as kids laughed and pointed. One day, the bus had reached its capacity and there were not enough seats for all the kids. So the bus driver had to sit us two and three to a seat. When she got to me a girl said, “There’s not enough room for her because she is like five people put together.” The whole bus went up in laughter; I sat there embarrassed, but most of all hurt. Kids would throw candy wrappers and Debbie cakes in my seat and tell me to eat it. Every day I would come home and run in my room to cry my eyes out. I realized that, not only was I a victim of discrimination, but I was suffering from bullying as well. I endured the same acts of hatred in school. As I walked down the hallways, the students would hold on to their lockers and yell, “earthquake!” Things had become so bad that students would force me to bring them snacks and money to school. Out of fear, I would comply, afraid of what might happen if I didn’t. I never spoke up because I was too scared of things getting worse. I was friendless because no one wanted to hang out with “the fat girl.” In gym class, I was always picked last or not at all; the students would complain about me being too big to run. During recess, the kids would ask me to be their horse and they would push me on the ground. I went through the name calling and harassing all the way until high school. Once I reached high school, I told myself enough was enough. I wanted to make a change. I was sick of being the victim of hatred and discrimination, so I took action. I became a member of the NAACP Youth Council. We focus on racial equality for everyone and we have several resources that we use to combat discrimination. I also use my voice through poetry and motivational speaking to lead by example and encourage my peers to fight hatred with peace. Through my efforts I was elected Vice President of Student Council. As Vice-President I host teen summits, poetry slams, and go around to different classrooms and let people know they don’t have to be subject to discrimination, neither do they have to condone it. As a result of my sermons I gained the nickname “The Preacher.” I will not stop here, I will continue on my journey toward overcoming discrimination so that neither I nor anyone else will ever be a victim of hate again.